Hey kids! Just when you thought those human-eating sharks were the worst thing to happen this summer, here's another kick in the shins. 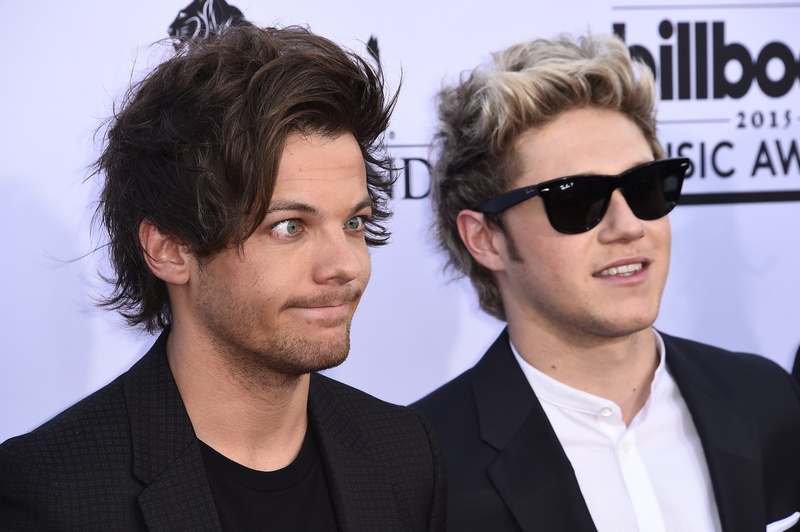 One Direction star Louis Tomlinson is expecting a baby, according to People. A "mutual friend" told the magazine that 23-year-old superstar is "happy and very excited about becoming a dad." Who's the lucky lady who will soon become a co-parent with one of the most famous faces on the planet? Allegedly, that'd be Briana Jungwirth, a stylist from Los Angeles. According to People, they are very, very good friends, and this baby news has "brought them even closer." So just how close are these two, and how did Louis and Briana meet? After he and his ex-girlfriend Eleanor Calder broke up, Tomlinson apparently started getting to know Jungwirth. Bustle reached out to Tomlinson's reps for comment, but did not hear back at the time of publication. People reports that they met through a mutual friend in March. Since then, they have been spotted on dates. But going on dates does not a committed relationship make, and the same source told People that they're not, like, together together. Friendship, huh? To be honest, that's a great place to start when you're going to raise a baby, so kudos to these crazy kids. But back to their origin story. There isn't a ton of info out there on our girl Jungwirth, but People reports that she only went to her first One Direction concert recently, so it's not like the girl was praying to One Direction posters at night and prepping her 1D concert outfits. In fact, she seems very private. There's little info on the Internet about Jungwirth. We know she's 23, she lives in L.A., she loves clothes, and she's good friends with Tomlinson. NBD, just allegedly having his baby, too. Supposedly, her first tweet was in March of 2015, and it was a retweet of Tomlinson's post celebrating that "No Control" could potentially be voted the song of the summer. Since then, she's shared various photos of her One Directioner, and has admitted that she doesn't have Instagram. Then again, People isn't sure if this is the real Jungwirth. Who can be sure of anything, really? If you're wondering if Jungwirth is a stylist for One Direction, that's a valid question, and at this point, with so little information out there, the answer is maybe? The main stylist for the band is Caroline Watson, who told Jezebel in March that she loves "working with someone like Louis as well, because Louis is very laid-back in his style." Is it possible that Jungwirth and Tomlinson locked eyes across aisles in a Silverlake thrift store and decided they'd be friends, then test out what parenthood is like together? Sure! Anything is possible. But until these two reveal more about how their friendship blossomed into a newborn, we'll just have keep guessing. And to Jungwirth, whose lack of Internet presence suggests she's keen on privacy, good luck. According to People, Tomlinson is looking for property near Jungwirth in L.A.